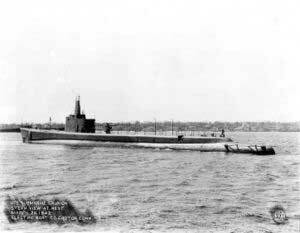 USS Grunion (SS-216) was a Gato-class submarine. She was the only ship of the United States Navy to be named for the grunion, a small fish of the silversides family, indigenous to the western American coast. Her keel was laid down by the Electric Boat Company in Groton, Connecticut. She was launched on 22 December 1941, sponsored by Mrs. Stanford C. Hooper, wife of Rear Admiral Hooper, and commissioned on 11 April 1942 with Lieutenant Commander Mannert L. Abele in command. Departing Hawaii on 30 June after ten days of intensive training, Grunion touched Midway Island; then headed toward the Aleutian Islands for her first war patrol. Her first report, made as she patrolled north of Kiska Island, stated she had been attacked by a Japanese destroyer and had fired at her with inconclusive results. She operated off Kiska throughout July and sank two enemy patrol boats while in search for enemy shipping. On 30 July the submarine reported intensive antisubmarine activity, and she was ordered back to Dutch Harbor. Grunion was never heard from nor seen again. Air searches off Kiska were fruitless; and on 5 October Grunion was reported overdue from patrol and assumed lost with all hands. Captured Japanese records show no antisubmarine attacks in the Kiska area, and the fate of Grunion remained a mystery. Her name was struck from the Naval Vessel Register on 2 November 1942. USS Grunion's Commanding Officer left behind his wife and three boys. In 2002, a Japanese man Yataka Iwasaki posted the translation of an article that had appeared in a Japanese Shipping Journal on a Web Site dedicated to USS Grunion. This piece written by a Military Officer from the Armed Japanese Merchant ship Kano Maru, told of the exchange of cannon fire and torpedoes with a US Submarine in an area where Grunion had been on patrol, and the submarine had disappeared. New focus for the Brothers Abele. The brothers now had a new focus, and they expanded their search near the Aleutian Islands of Alaska. Two Japanese Sub Chasers SC-25, and SC-27, sunk by Grunion were found as was Arara, a Japanese Destroyer that was sunk in the same area. Lieutenant Commander Abele was awarded a postumous Navy Cross for exploits prior to his loss, and his widow Catherine believing all his crew had deserved recognition took on the task of writing to all the other 69 bereaving families. Some of the heartrending responses she received in response to her initiative make interesting reading. 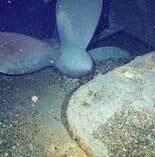 Search for the wreck of USS Grunion. Robert Ballard of Titanic fame was approached to look for the submarine, but he declined that invitation. The Abele brothers then hired Williams and Associates, a Seattle ocean surveying company, and charted a crab fishing boat, Acquila, captained by Kale Garcia, a man used to working in dangerous waters. The search boat equipped with sonar gear able to feature high quality images began its task of scanning hundreds of square miles of the ocean floor off Alaska recently. It traversed a grid looking, looking, looking, nothing returned but ocean bottom images. Then, at last on August 22nd. 2007, the scan reported a smooth oblong image, with what looks like a tower and periscope mast. It may well be that the wreck of USS Grunion and her 70 crew members has been found, 1,000 feet below the surface, sitting on the ocean floor. 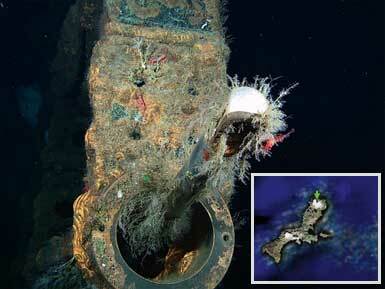 The periscope of Grunion, inset, the location of the wreck. Search for 69 families of Grunion's crew. Three relatives of Grunion's sailors started to research the families of all of her crew members, and thus far have found and contacted 68 of the possible 69, but one remains elusive, the family of Byron Allen Travis, a Seaman second class. Brad Abele's story about his Father and his Submarine. See this URL: http://www.999info.net./Jim.pdf for Brad's story in memory of his Father Lieutenant Commander Jim Able USN, and his command of USS Grunion. All the families involved may at long last bid farewell to their relatives who died back in 1942 whilst at sea serving their country in WW2.